When we install your glass veranda it comes with toughened glass as standard. The reason we install toughened glass rather ordinary plate glass is safety. If something hits toughened glass it breaks into lots of small granular pieces which are not especially dangerous. Plate glass on the other hand produces a shower of sharp pointed shards which are extremely dangerous. We bring the glass to your house wrapped either in bubble wrap or some form of polythene. These are protective layers which are provided by the glass company when we receive their glass panels. It prevents it from breaking should the truck on which it is being delivered stops suddenly causing something to hit the glass. It also means that the men loading and unloading the glass have got a protective barrier surrounding the glass to stop minor bumps and scrapes from damaging the glass. The protective layer of polythene or bubble wrap, sometimes with foam spacers to keep the individual sheets of glass apart, is stuck to the glass sheets with a slightly sticky coating. As we unload the glass we clean each one with Methylated spirit to remove this coating. If we don't remove the coating at this point the sheets of glass are left with a slight whitish appearance which looks unsightly and creates a great deal of work for your window cleaner. So when we install your glass veranda you will end up with a roof of perfectly clear glass to look through. For tough stains we use white spirit. This get rid of nasty glue stains which come from the labels attached to the glass when it leaves the factory. After we leave and the dust starts to collect on the top of the glass roof how do you clean it? The best solution is to ask your window cleaner to do it. He will probably have some sort of pole system which he can use to access the top of the roof and get right up to the wall plate where the glass and the house meet. He will simply apply his usual system, clear water or fairy liquid to the glass and clean it off in the normal way. If you need to do this yourself the glazing bars are quite strong and should be able to withstand the weight of a medium sized person if the load is spread over the width of the veranda using a crawling board. When you are on the roof use fairy liquid and a cloth to clean the windows and then if you have a squeegy use this to clean off the excess water and dirt. After this you can use a linen tea cloth or a linen scrim to polish the glass. For stubborn spots and oil marks use the Methylated Spirit to remove these before finishing with a soapy cloth and linen scrim. This is what our glass company recommends. If you are worried about climbing on board the roof of your glass veranda using the crawling board system you can rent a conservatory cleaning ladder. These are wonderful devices which have the foot of the first section of ladder on the ground and the top resting on the gutter of the glass veranda. The second part of the ladder flops over onto the roof and supports the person who is cleaning the roof. The whole apparatus is prevented from slipping off the roof by a cable which is attached to the conservatory itself. This means that this job can be done one-handed. 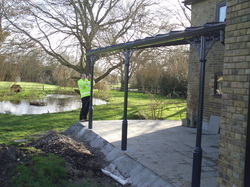 If your glass veranda is very large it is best to use a professional cleaning firm to undertake the job. That way your safety is not compromised and you will maintain the structure in pristine order for years to come. Always make sure that you are safe when doing any job at height. One slip and you are on the ground with broken bones or worse, so take care and happy cleaning.